Do you remember that ubiquitous chicken stew of the 1980s made with a can of Campbell’s Cream of Mushroom soup? You’d pour the soup over browned chicken legs and simmer until the meat literally fell off the bone, then serve it over white rice. I had that stew in mind when I created this comforting main dish. 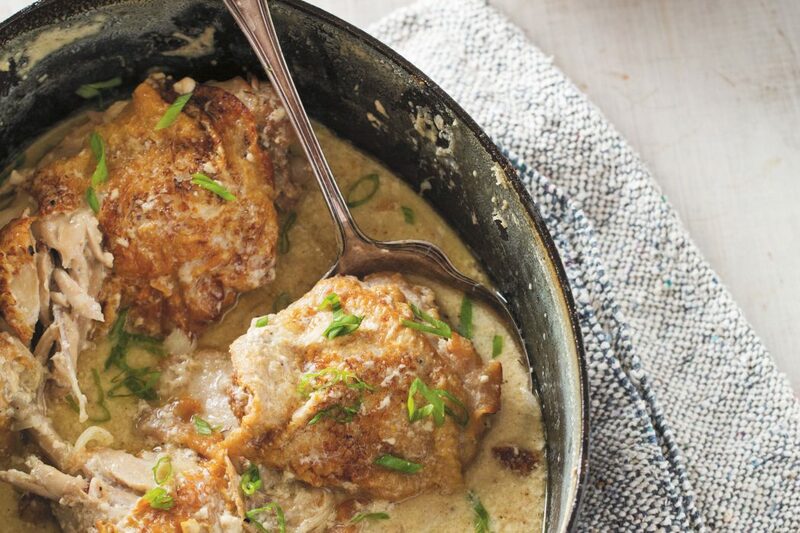 Milk may not seem a likely braising liquid, but it works beautifully, tenderizing the meat and combining with the chicken juices and spices to create the sauce. One of the appealing things about braising chicken is that, unlike other braised meat, it cooks very quickly. You can brown the meat in advance, assemble the braise and refrigerate it, then pop it into the oven just before you want to eat; in under an hour you’ll have a comforting main course that’s perfect for a snowy evening. Don’t be alarmed if your sauce curdles slightly—it’s perfectly normal. If the appearance bothers you, you can always whiz the sauce with an immersion blender until smooth. Serves 6 as a main course. Preheat the oven to 300°F. Season the chicken thighs on all sides with salt and pepper. In a large Dutch oven, heat the canola oil and butter over medium-high heat. Once the butter has melted, add half the chicken thighs, skin-side down, and cook until the skin has browned and the fat has rendered out, about 5 minutes. Flip and cook on the second side until golden brown, 4 minutes more. Transfer to a rimmed baking sheet or plate and repeat with the remaining thighs until they have all been browned. Set the chicken aside. Reduce the heat to low and add the onions, celery, orange peel, star anise, and cinnamon stick to the pot. Cook, stirring, for 5 minutes. Add the flour to the pot and stir with a wooden spoon until lightly toasted, about 1 minute. Whisk in the milk and increase the heat to bring the milk to a simmer. Return the chicken and any accumulated juices to the pot, skin-side up; they should be partially submerged in the liquid and tightly packed together in a single layer. Add the bay leaf. Cover the pot and transfer to the oven. Bake until the chicken is tender and cooked through, about 45 minutes. While the chicken cooks, make the rice: Heat the canola oil in a 2-quart pot over low heat. Add the shallot, garlic, coriander, cumin, and salt and cook, stirring, until the shallots are slightly translucent, about 5 minutes. Add the rice and cook, stirring, for 1 minute, until toasted. 45 minutes. Uncover the pot, fluff the rice with a fork, and add the butter. Re-cover, remove from the heat, and let stand for 10 minutes. Remove the chicken from the oven, uncover, and remove and discard the star anise, cinnamon stick, and bay leaf. Transfer the chicken thighs, onions, and celery to a platter and spoon the sauce over the top. Garnish with the scallions. Serve with the spiced rice alongside.